Featuring some of the best hiking trails in New England, this expansive trail network is the perfect escape to New Hampshire’s White Mountains and 4000 footers. Also enjoy mountain biking, disk golf, ResortBoard and Onewheel rentals. Use 6 Village Rd. Waterville Valley, NH 03215 to find us! For more information, please call 603-236-4666. Stay informed on daily trail conditions and the skier experience with Ian Cullison's Director's Diary before you hit the trails. Or... check it out when you need to day dream a little while you're stuck in the office. Join the Nordic Streaks program every Wednesday, non-holiday, at 10am at the Nordic Center in Town Square for 2 hours of fabulous Nordic skiing with our professional guide. Participants then can enjoy their own lunch at the Nordic Center, with complimentary coffee and pastries. Nordic Streaks program members are welcome at all Silver Streak après ski, banquets, and other special social events. Alpine Silver Streaks may drop in to ski with the Nordic Streaks at no extra charge. All participants must either purchase a daily trail ticket or have a Nordic Season Pass. Nordic Streaks Program will start as soon as trail conditions permit. This youth program for beginners is designed to share the fun of Nordic skiing with kids ages 5 to 12 by introducing techniques, playing games, and having a great time on skis! Cost is $20 per session. Price includes trail pass, rentals, instruction and a cup of hot cocoa after our ski. Special pricing for parents, too! 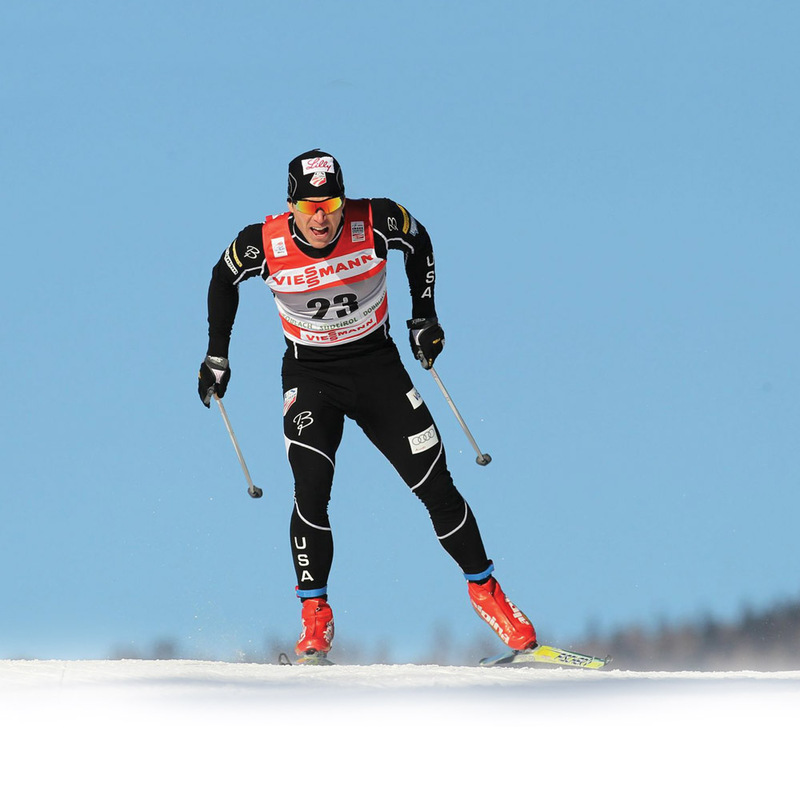 Learn advanced techniques for Nordic skiing from 4-time Olympian Kris Freeman and classic technique with our race coach. Space is limited, pre-registration is required. Skate: Learn to optimize body position for better power, increased cadence, and more complete weight transfer. The Adventure Center has several trails designated for daily fat bike use, see trail report for open trails. Additional terrain open for fat biking on Sundays and Thursdays as conditions allow. Go where you can't with your mountain bike. What started as a way for cyclists to ride through the winter, now is a fun, year-round activity on terrain that was once un-rideable (snow, sand, and mixed-condition trails). The wide, or FAT, tires and low tire pressure (4 inch minimum with a PSI of less than 15) roll like a snowshoe over snow and sand. The low tire pressure gives great traction in the snow and over rocks and roots. $32 for a half day and $42 for a full day. $50 Full Day Rental & Trail Pass Bundle. Our rental bikes are by Framed Bikes of St.Paul, MN. Join a staff member for a 30-60 min. intro and ride leaving from the Adventure Center. Dress warm and wear insulated footwear and heavy gloves. Please call ahead to confirm ride is on for the day! Ride only when you can travel over snow without leaving a rut deeper than one inch. Ride on the firmest part of the trail. Leave room for skiers to pass (Please do not ride side-by-side blocking the full trail). Allow the trail time to set up after grooming and before riding, if the tire leaves a rut of more than an inch, chose a different activity for the day! Help out and get involved by joining your local NEMBA chapter. Wide tires — deep snow coverage may require tires wider than 4 inches. Tire pressure often be less than 10 PSI. For more information, call the Adventure Center at 603-236-4666. Many of our Nordic and alpine skiers and non-skier guests are discovering that this activity offers a low cost, easy and enjoyable way to experience the winter landscape while improving your physical fitness. Snowshoeing requires no special skills. If you can walk it's a cinch. We also have racing snowshoes available if you want to try winter trail running. Like hiking and walking, snowshoeing is a low impact activity that people with average fitness levels can enjoy. Runners, cyclists and other active people have found that depending on your pace, the snow conditions and your work-out schedule snowshoeing can be an excellent aerobic activity. All you need is a trail pass and snowshoes--just $37 with rentals. Since there are no lifts required and you can go virtually anywhere, a snowshoe adventure can be a self-guided, casual, spur of the moment walk in the woods or a daylong trek to a local summit. Guided tours are available on the weekends. Nordic Lessons: Upgrade Your Nordic Skills and Have More Fun! 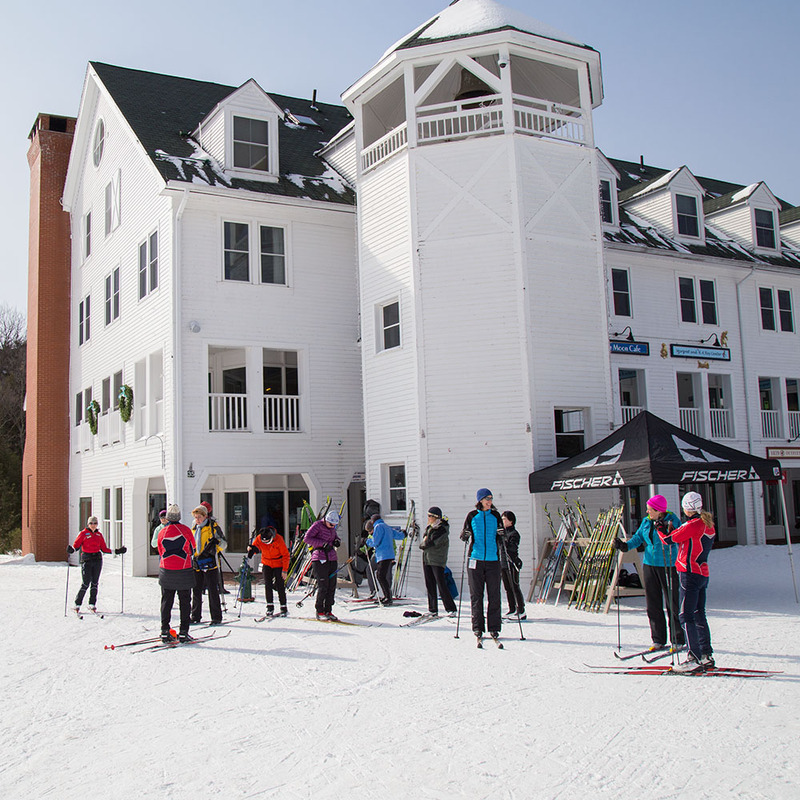 Ski lessons are a specialty of Waterville Valley's Adventure Center. Our instructors provide the kind of coaching that not only builds skills, it builds a strong foundation for the future of the sport. In order to help you get the most from our expansive terrain, our ski school offers a wide range of programs for all ages and disciplines - from skating to traditional striding. Lessons on week days by appointment only. Call 603-236-4666. Learn to Nordic Ski: Learn how to cross-country ski in a friendly group setting. If you've never savored the Nordic experience, we can help you get started, with Group (3 or more) Learn to Ski packages that include lessons, rentals, and trail fees for only $51. Weekends and holidays, mid-week by appointment. Private Lessons: Available for all skill levels for those who feel that individual learning fits into their skiing plans. This lesson is geared toward the skier's specific needs. Both Classic and Skate disciplines available. $44 per person, $76 for trail pass and rentals. Nordic Adaptive: We also offer Adaptive lessons for those athletes interested in Nordic. First timers and more experienced cross country skiers are all welcome! Please call the Adaptive office for more information, 603-236-8311 ext 3175 or e-mail Cynthia Powell at info@watervilleadaptive.com. Waterville Valley is pleased to bring winter sports to everyone! Race Coaching: Meet your goals this season. Sessions address techniques to improve your skills and performance. Take one lesson or design sessions as part of a training plan.